Chiapas is a southern Mexican state bordering Guatemala. Its mountainous highlands and dense rainforest are full of Mayan archaeological sites and Spanish colonial towns. Despite its incredible scenery, Chiapas isn’t really a top destination when one thinks a trip to Mexico. And it should be. 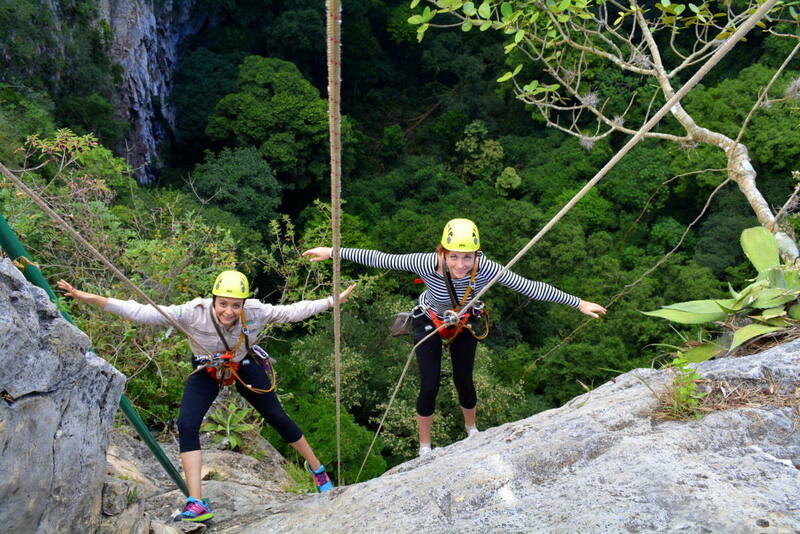 Where else you can rappel down Sima de las Cotorras full of birds? Despite living in Mexico for 2 years and revisiting a few times, I made it to Chiapas only this year (2015). Obviously, I wanted to visit the Palenque ruins and stay in San Cristobal de las Casas – Chiapas most popular destination. 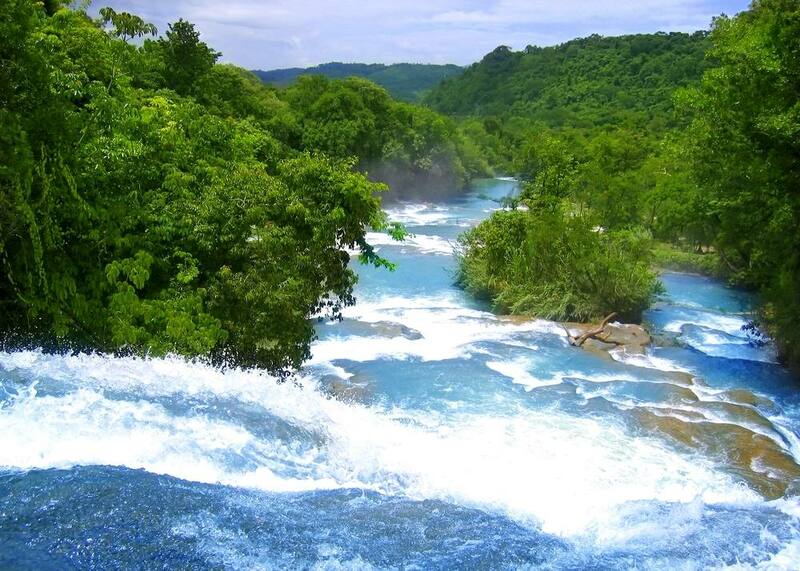 And pay a visit to a few waterfalls, such as the most famous Agua Azul. Anyways, when I stumbled upon an opportunity to visit Sima de las Cotorras, known in English as the Sinkhole of Parrots, I couldn’t miss it! 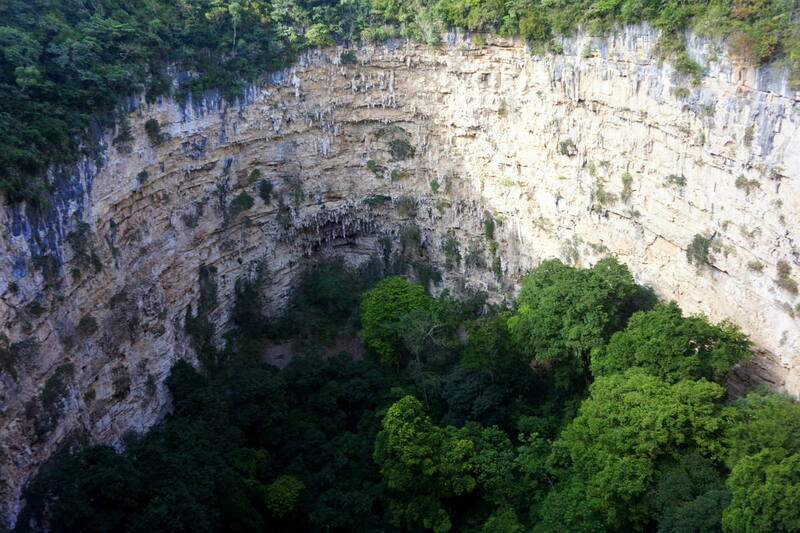 Sima de las Cotorras, as the Spanish name indicates, is a huge sinkhole with a forest at the bottom of it. The sinkhole itself is 520-feet wide and 460-feet deep, so there are many birds and iguanas living in there. But the most iconic inhabitants are the green parakeets! Hundreds of green parrots fly out of there every morning and trickle back in every late afternoon. Like many other similar sinkholes in the area, Sima de las Cotorras was most likely formed out of the limestone rock by the gradual dissolving power of an underground river, such as the nearby Río La Venta. Another unique feature of this particular sinkhole is that 230 feet (70 meters) down from the rim there are 46 rock paintings, which experts believed were painted by ancestors of the native Zoque people as many as 10,000 years ago. But enough about the history of it. 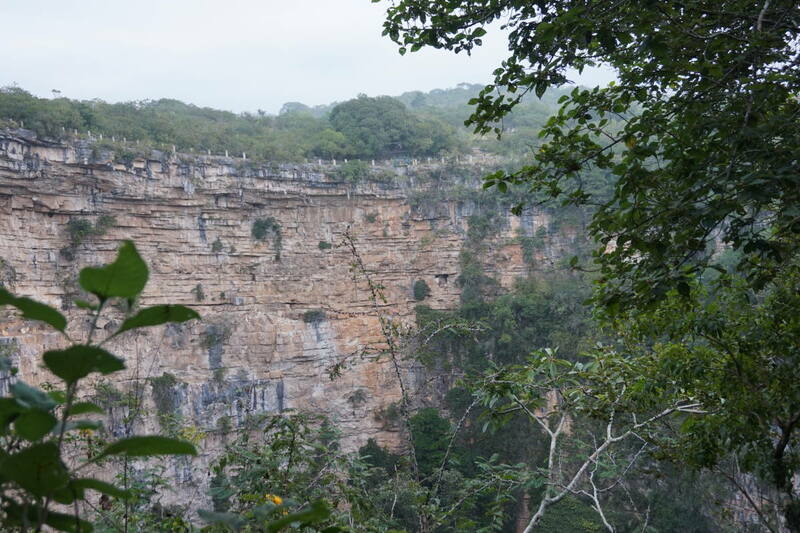 I explored Sima de las Cotorras with Ecoexperiencias Chiapas. They offered transportation and fully supervised rappeling in the sinkhole. I must admit I’m scared of heights, but I somehow always push myself to do scary things such as bungy or rock climbing. I got picked up by Ecoexperiencias from Tuxtla, the biggest city of Chiapas, as early as 3 am to get to the Sinkhole on time. Green parakeets flying out for the day very early, so no sleep for you if you wanna see them. It was an incredible experience and I’ve had no idea these birds are actually so loud. 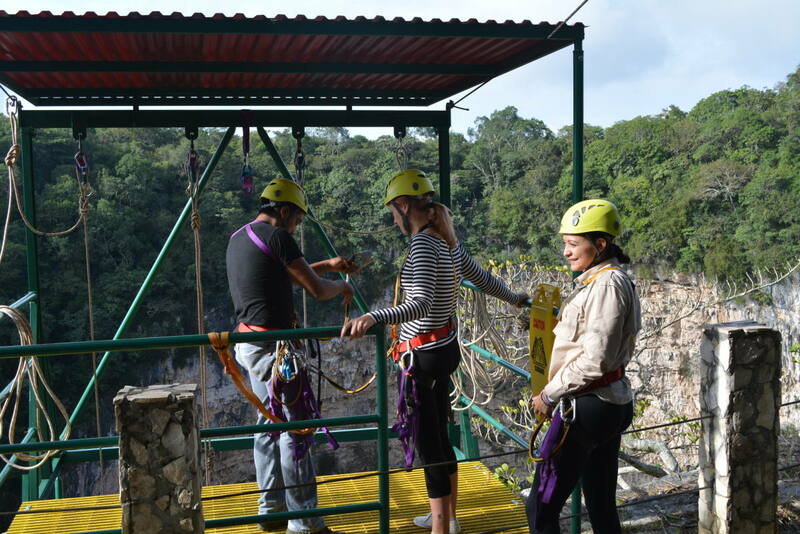 But the best part of the tour – rappeling was yet to come. Right after a delicious breakfast containing some cheese empanadas with my favorite salsa verde, we started to prepare for rappelling. Since it was only me and the PR manager from the company, the whole experience was really personalized. I could take my time and go down my rope at my own pace. I think it took me over 15 minutes to get over my fear and finally look down. It was definitely worth it! I even impressed myself by being able to swing on my rope for a little bit. As afraid as I was about climbing back up, it turned out to be easier than I thought. I guess maybe my aerial acrobatics training made me stronger, as I actually climbed up quite fast. 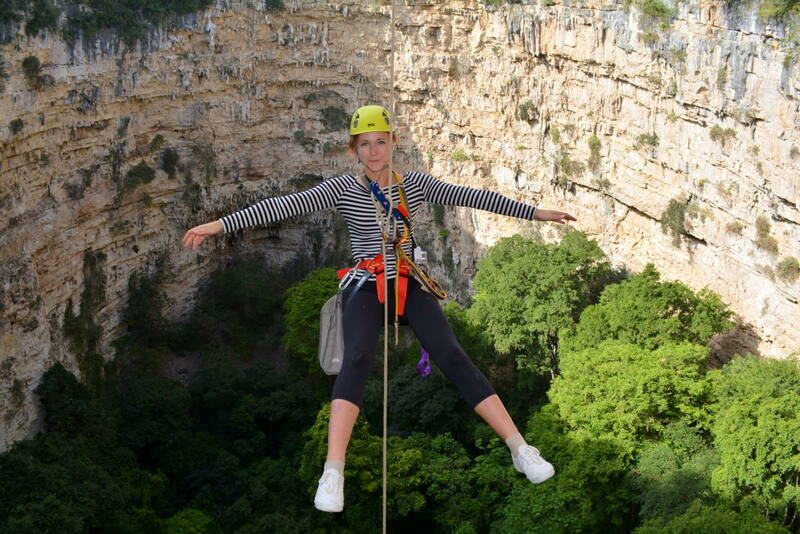 I’m very glad I’ve done this rappel as it was definitely one of a kind! People from Ecoexperiencias Chiapas couldn’t have been more friendly and professional about the whole experience. 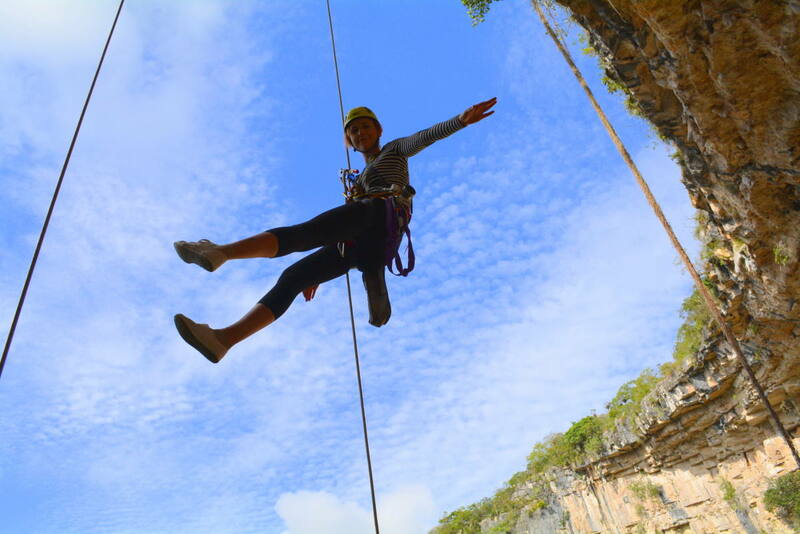 If you’re ever in Chiapas do yourself a favor and do the rappel at the Sinkhole of Parrots!